1950s Retro fashion is very popular this year. 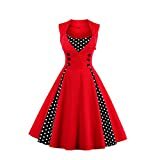 Occasion This retro dress is perfect for everyday casual, formal party, ceremony, Celebrity Party, Homecoming, banquet, evening, cocktail, wedding, etc. If you have any questions about sizes or other questions, please contact us in advance.